Most people know about Zipcar and Car2Go and ReachNow carsharing. But many don’t know that commercial carsharing in the U.S. got its start in Portland 20 years ago. 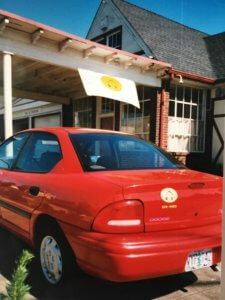 That’s when start up company CarSharing Portland, founded by Dave Brook and staffed by Russell Martin (General Manager) and Maren Souders (Outreach & Customer Service), launched with two cars on March 28, 1998 at an old gas station at SE 21st and Division. 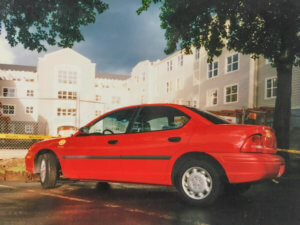 Aware of commercial carsharing in Switzerland and Germany, which had started in the mid 1980s, Brook explored the idea with Reed College psychology professor Dr. Richard Katzev, who brought Conrad Wagner, one of the founders of Mobility Carsharing of Switzerland, to the U.S. in 1986 to promote the concept. Later Dr. Katzev did the first formal evaluation of the impacts of carsharing on member vehicle ownership and trip patterns, which showed less car ownership, less energy consumption, and member financial savings. 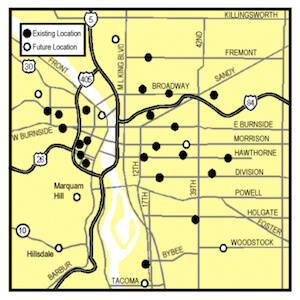 Map of early Carsharing locations in Portland around 2000. Through the efforts of Nina DeConcini of the Oregon Department of Environmental Quality, and Francie Royce of the Portland Bureau of Transportation, EPA provided a small grant to assist in marketing and evaluation, and logistical challenges facing the company operating on city streets. Oregon Environmental Council’s then transportation program director Chris Hagerbaumer participated in the steering committee that supervised the grant and assisted the start up company in overcoming administrative and logistical challenges. Although CarSharing Portland is no more, the company demonstrated that there was a market for shared mobility in the U.S. and that carsharing could be a viable business. In 2001 CSP merged with sister company, Flexcar, founded in 2000 in Seattle, which seven years later merged with Zipcar, founded in 2000 in Boston. Now there are many models of carsharing, serving more than 1.4 million members in the U.S. with services in more than 21 cities. In the three years before it merged with Flexcar, CarSharing Portland grew to 25 vehicles and 500 members parked at locations in all the close-in neighborhoods and downtown Portland, offering a variety of vehicles including sedans, pickup trucks and minivans, and the first hybrid vehicle in a carsharing fleet. CSP went from a clipboard reservation system with a cell phone passed between the on-duty staff person, to an automated telephone reservation system. It predated the first in-car technology for car unlocking and trip tracking, instead depending on external lockboxes and driver log books to keep track of trips. Carsharing is not only a profitable business model, it’s also good for the planet. Research finds that one carsharing vehicle replaces 9 to 13 vehicles, that carsharing members increase their use of public transit and walk and bicycle more, and that this all adds up to reductions in round-trip greenhouse gas emissions of 34-41 percent. As we celebrate the 20th anniversary of the launch of commercial carsharing in the U.S., we should be proud that Portland, Oregon was a leader. 1 Reply to "Carsharing in the U.S. turns 20"